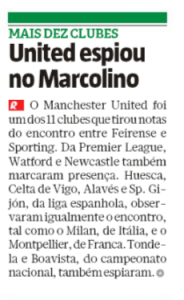 Newcastle United were reportedly among the clubs who had scouts at Feirense’s league game against Sporting on Sunday. Newspapers Record and O Jogo both report the Magpies’ visit to the Estádio Marcolino Castro, in a game which ended with an unsurprising 3-1 win for the away side. Although Newcastle’s targets aren’t clear, there’s one guy who certainly got all the attention. Midfielder Bruno Fernandes scored a brace, once again with a free-kick goal, and has shown his importance to the Lions one more time, being an unanimous man of the match. There should be an exciting auction for him next summer, as he’s currently protected by a €100m release clause… which makes him Newcastle-proof. Other Sporting players such as Renan, Tiago Ilori, Diaby and Acuña all had good performances as well, but still didn’t get to the Portuguese midfielder’s level. For the away side, there was not much to impress. Manchester United, Watford, Celta Vigo, Alavés, Sporting Gijón, Milan and Montpellier were other clubs who had scouts at this match.